Eczema is a condition which causes the skin to become inflamed and irritated. The most common type of eczema is called atopic dermatitis, atopic eczema. Atopic refers to a grouping of diseases that has inherited a tendency to develop allergic conditions such as hay fever and asthma. Eczema affects are a significant percentage of infants, anywhere from 10% to 20% of children suffer from eczema. Nearly 3% of adults and children in the U.S have it as well. Most infants who develop eczema grow out of it by the time they are age ten; others will continue to have symptoms from eczema on and off throughout their life. The disease often can be controlled with proper treatment. Eczema can affect many parts of the body. However, there is almost always itchiness. Sometimes itching will start before the rash is apparent, and when it does the rash, most commons appears on the face, knees, hands, feet, wrist or back. It may also affect other areas. Areas affected busy appear with the dry and scaly skin. In people with fair skin, theses areas frequently appear reddish and then turn brown. 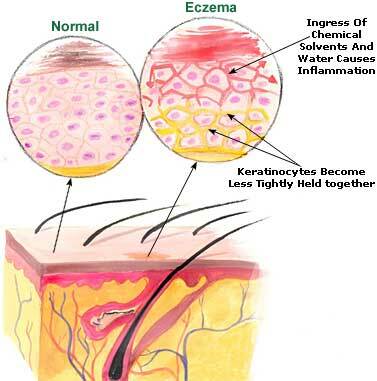 In darker skin individuals, eczema can affect pigmentation making the area lighter or darker. In babies, the itchy rash can create an oozing cutting condition that happens essentially on the face and scalp, but spots may appear anywhere. The primary cause of eczema is unknown, but it is considered to be associated with an overactive reaction by the body immune system to an irritant. Its is this response that causes the symptoms of eczema. Also, eczema is generally found in families with a history of other allergies or asthma. Defects in the skin barrier could allow precipitation out and germs in. Some people may have “flare-ups” of the tingling rash in response to certain substances or conditions. For some, touching rough or coarse materials may cause the skin to become itchy. In others the sensation can be too cold or hot, exposure to particular household products like detergent or soap, or coming into contact with animal dander may cause an outbreak. Upper respiratory infection or colds may also be triggers. Stress may cause the condition to worsen. There is no cure; most people can use effectively manage their disease with medical treatment and by avoiding irritants. The condition is not infectious and can not be spread from person to person. 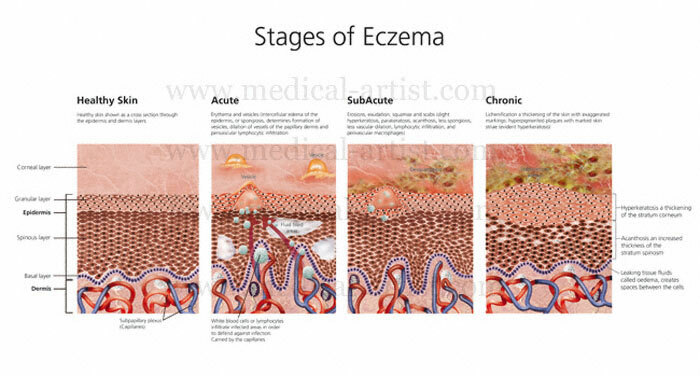 Dermatologist, pediatrician or primary car provider can make a diagnosis of eczema. Although there are no test to determine eczema, the doctor can tell if it is eczema by examining at your skin and by asking a few questions. Since may people with eczema also suffer from allergies you doctor can conduct allergy test to determine possible irritants or triggers. Children with eczema are particularly likely to be tested for allergies. The main reason for treatment for eczema is to relieve and prevent itching; which can cause infection. Because eczema makes the skin itchy and dry, lotions and cream are recommended to maintain most skin. These products are usually applied when the skin is wet, like after a bath, to help the skin retain moisture. Cold compresses can also be used to relieve itching. There are over-the-counter medications, such as hydrocortisone 1% cream, and prescription creams and ointments that have corticosteroid, and are offered to patients to reduce the amount of inflammation. Also, if the-the affected area becomes infected, you doctor may prescribe antibiotics, to eliminate the bacteria causing the infection. Other treatments may be antihistamines to reduce severe itching, chemicals design to lessen itching, such as tart treatments, and therapy using ultraviolet light applied to the skin, such as phototherapy, there is also drugs such as cyclosporine for individuals whose condition does not respond to other treatments. The FDA has approved two drugs known as topical immunomodulators (TIMS) for the treatment of mild-to-moderate eczema. The medications Elidel and Protopic, are skin creams that work by modifying the immune system response to prevent flare-ups. However, the FDA has a warning for doctors who prescribe Elidel and Protopic, due to concerns about possible cancer risk for using it. There are two creams that carry FDA’s “black box: warning on their packing to alert doctors and patients to these potential risk. The warning advises doctors to prescribe short-term use of Protopic and Elidel and other available eczema treatments that have failed in adults in children over age 2. How can you prevent Eczema Flare-ups? Eczema outbreaks can be avoided be avoided or the severity lessened by following several simple times.